Sea Glass "special beaches" belong to all of us! ...they belong to Mother Earth and therefore, they belong to all of us! My husband and myself only started our sea glass "odyssey" six months ago. Anyway, after researching sea glass and finding this site, did I learn of a wonderful beach that yielded a rare yellow, a rare teal, an olive green, a beautiful white milk glass shard (I should have kept that one) and about 700 pieces of white, brown, green, and sea foam in six days this past August!!! 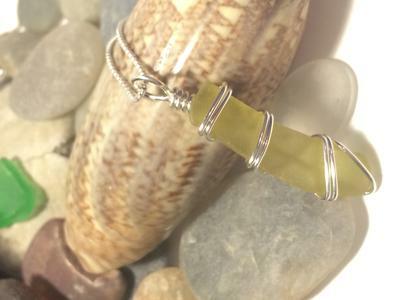 My husband and I decided to start our own sea glass jewelry business...I get first picks of course :), but we are blessed in that my husband has a God given talent for making beautiful jewelry from our finds, and has been discovered by a Gallery where we now sell some of our sea glass and beach stone jewelry!! I think that sharing where you find glass is paying it forward...look what this site gives us...sea glass beach reports! If it weren't for Odyssey Sea Glass, I would have never found the 26 mile stretch of beaches we hunt on the Treasure Coast of North Carolina...Topsail Island beaches...there I said it and I didn't turn into a pumpkin! So many people are "protective" of their spots/special beaches, and yes, even I get a little antsy when I am up at dawn and I reach the spot, or honey hole as we call it, and I see others already on the beach. However, these are PUBLIC BEACHES, which means ANYONE can walk on them, ride their beach cruiser on them, look for shells, and YES, even look for sea glass. So, yes I feel that telling others about sea glass locations is a kind gesture...it is also important to educate yourself about sea glass such as when to throw that piece back into the ocean because Mother Nature isn't finished with it yet, and to respect others when sea glass hunting. We all want to find as many unique and rare pieces as possible, but to some, just finding that one piece because you let them in on your secret beach hunting spot, makes their day and puts a smile on their face. That is what I call paying it forward. Comments for Sea Glass "special beaches" belong to all of us! Would you share the special place? My husband and myself are going to VA beach tonight and were wondering if you would be willing to share your special sea glass place with us? We thank you very much! I wrote the article "Sea Glass Special Beaches Belong To All Of Us"...but my treasured yellow sea glass necklace pic is upside down...so sorry, and I wish that I could fix it so it is upright instead of sideways! I have been collecting sea glass ( I called it water glass) for at least ten years from the beaches in New Jersey specifically Atlantic City as I drove my 74 year old mom down to the casinos and as she gambled. I walked the beach for glass - I gave at least five gallon jars filled and always thought someday someone will make jewelry out of it. That is exactly what I see now the past year here in Atlantic city. Sadly I no longer see any sea glass on the beaches as they built up the beaches and what was once the beach is now at least 30 feet under water. I am recently retired and I am going to plan a trip to Topsail Beach in April before the summer rates start.. I live close to the Chesapeake Bay, and it's so sad that the state of Maryland sold it's soul to allow the majority of the bay, river, and ocean front properties to be owned by wealthy, private individuals, with very little access and even less land preserved for public use. However, I have found an incredible new "world" within a few hours' drive - disappearing islands, tiny waterfront county parks, remote fishing villages, amazing fresh-off-the-boat seafood, kind people, and a lovely, slower pace of life - since I found my first piece of beach glass May 20, 2015. Nice post! Can you tell us where you found the nice beaches?